Our comprehensive TEFL Certification programme as well as our specialist mini courses are inspected every year in order to ensure the same high standards are kept. 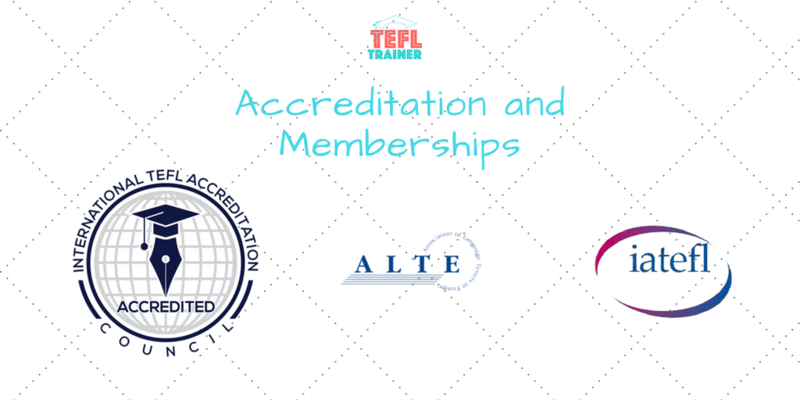 Accreditation simply shows that we belong to the TEFL community and that we thrive to offer a high standard of TEFL certification. We offer a unique combination of Online practice (used for TEFL Theory), on-site TEFL Practice (with teaching internships and our weekend classroom-based courses in Valencia and in Madrid), and TEFL reflection (with written assignments to be handed in) for further hindsight and understanding of the industry. 100% Online courses (w/ or w/o Skype mentoring sessions) are also possible and lead to TEFL Certification. TEFL Trainer is also a member and affiliate of numerous professional bodies such as ALTE (The Association of Language Testers in Europe), The College of Teachers, iaTEFL, and Langualist. TEFL Trainer is endorsed by numerous universities across England, Ireland, Scotland, the Netherlands, and Poland. TEFL Trainer runs a medium-sized TEFL Certification Programme across Valencia, Barcelona, Valladolid, Castellón la Plana, and Madrid. We also offer online and classroom-based TEFL certification programmes where we strive to maintain a high standard of class delivery and support to our aspiring TEFLers.